The last couple months I’ve been having a blast experimenting with jackfruit and a few the recipes I’ve created are quickly reaching obsession level. 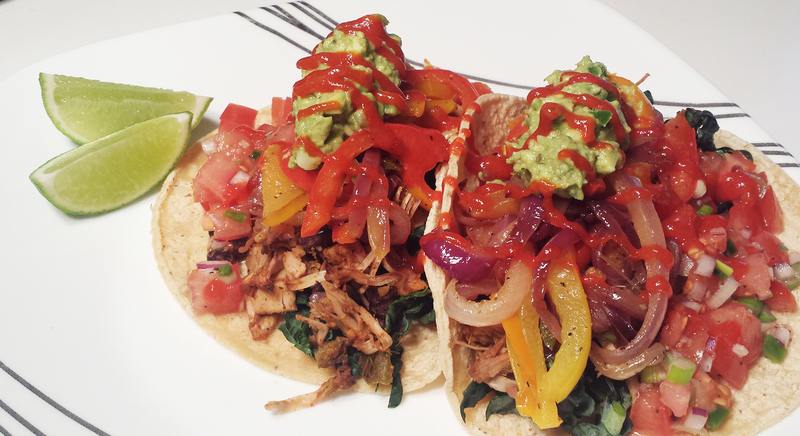 For instance these tacos. 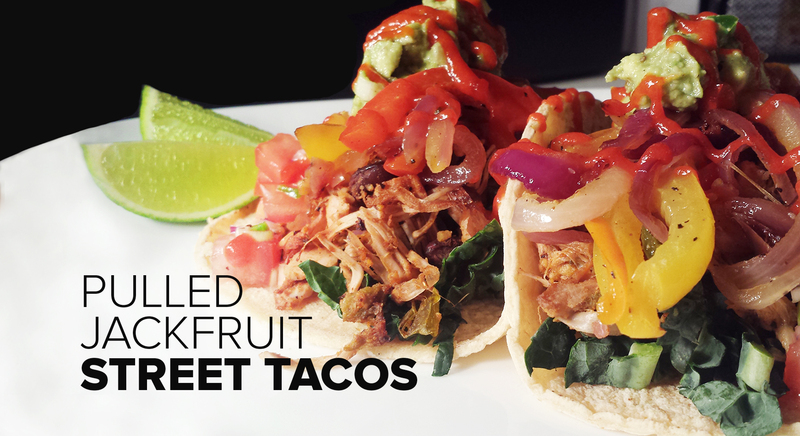 The jackfruit is easy to prepare and takes on the appearance and texture of shredded pork or chicken seasoned with my favorite taco spices, smoky chipotle powder and finished with a hint of fresh lime juice. For that addicting street taco appeal I then pile it into a warm corn tortilla with perfectly caramelized red onion, bell peppers, fresh guacamole and zingy pico de gallo. The flavors are so bright and decadent at the same time, it’s hard to believe these are healthy let alone vegan. I always make extra to pack for lunch the next day…they usually don’t make it that long. Let’s talk jackfruit for a minute. If you’re new to the vegan community you’re probably going “jack what?” It’s definitely not your everyday grocery store ingredient. Jackfruit is the very large fruit of the jackfruit tree that is native to South and Southeast Asia. It’s a member of the fig, mulberry and breadfruit tree family known as Moraceae. The fruit of these trees is the largest tree-borne fruit in the world and can grow as large as 80 lb in weight, 35 inches in length, and 20 inches in diameter. I’ve seen one fresh one at a grocery store back in the day and it was pretty intimidating. Now that I know a bit more about the fruit, I’d love to try my hand at breaking down a whole one but in the meantime my recipes utilize the convenience of canned jackfruit. You can almost always find it in Asian grocery stores, health food stores, or occasionally in the ethnic aisle at the grocery store. I purchase a case of 18 cans at a time online and keep them as a pantry staple for all types of tasty things. 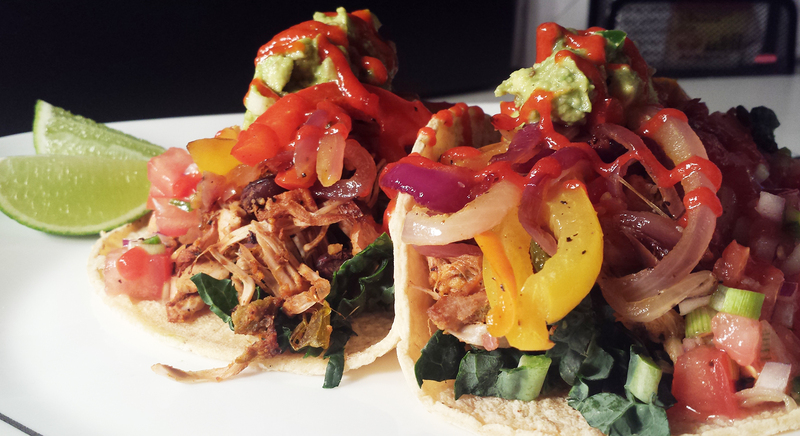 These tacos are more or less a conglomerate of a few small recipes and so I’ve listed them out as such. I’ve turned this dish into a buddha bowl with brown rice or quinoa at bottom and made rows of the toppings. If you just want good old chips and salsa/guac those “sub” recipes will make your taste buds happy. Preheat the oven to 400 degrees. Drain both cans of jackfruit and place jackfruit chunks onto a large rimmed cookie sheet. Shred the chunks by pulling the flesh apart with your hands. You can also chop it roughly with a chef knife but I like the appearance of the fruit when it's manually shredded. 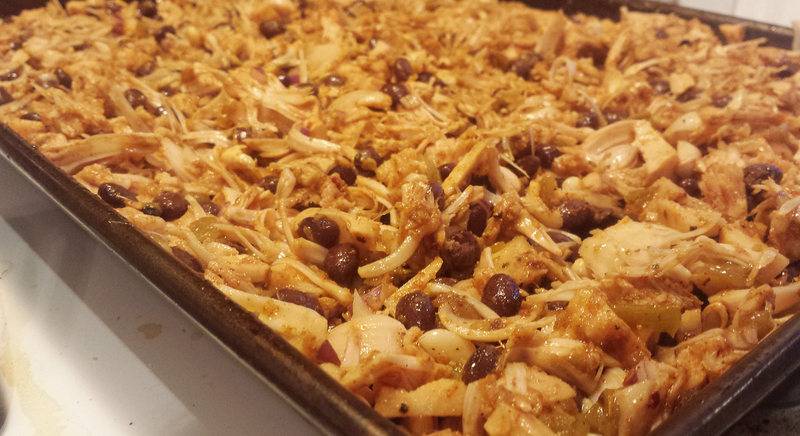 Drain and rinse your black beans and pour both beans and the can of chiles over the jackfruit. Finally chop you red onion and sprinkle over the tray. Drizzle everything with olive oil and sprinkle on the taco seasoning. If you don't have a taco seasoning pack swap out for 1 Tbsp chili powder, 1 tsp garlic powder, 1 tsp cumin, 1 tsp salt and pepper. 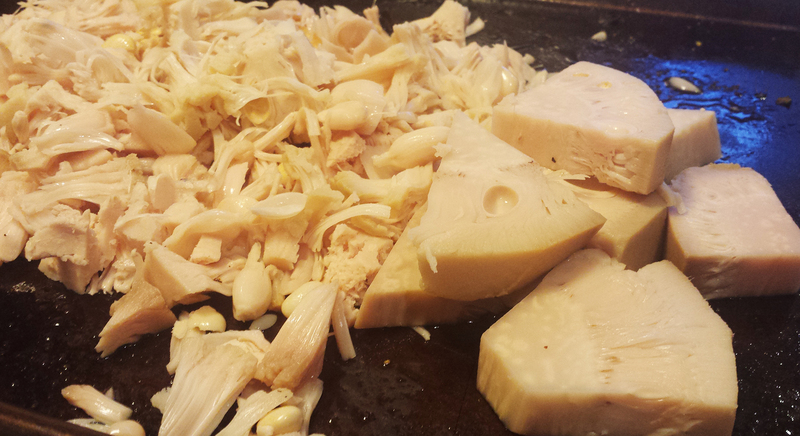 Mix the spices and oil into the jackfruit using your hands. Make sure everything is coated well. Bake at 400 for 30-35 mins. Squeeze juice of 1 fresh lime over the jackfruit while warm. While your jackfruit is baking chop your fajita veggies into strips (see photo) and heat your olive oil in a large skillet to medium high. Place your red onion in first, break it up with a spoon and then leave it alone for 4-5 mins allowing it to start caramelizing and coloring. 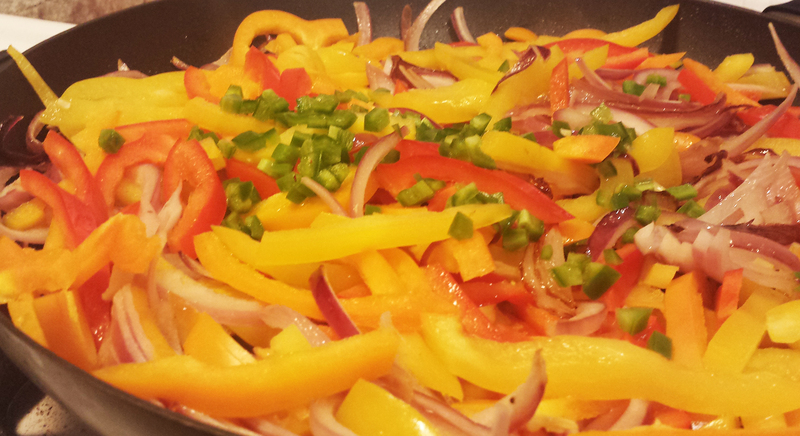 Add in your peppers and crushed garlic, stirring to incorporate everything. Continue cooking on medium high for 20-25 mins. The key to great fajita veggies is not stirring too much..only do it every 3-4 mins so that tasty golden brown color can develop. Salt and pepper then turn off heat. 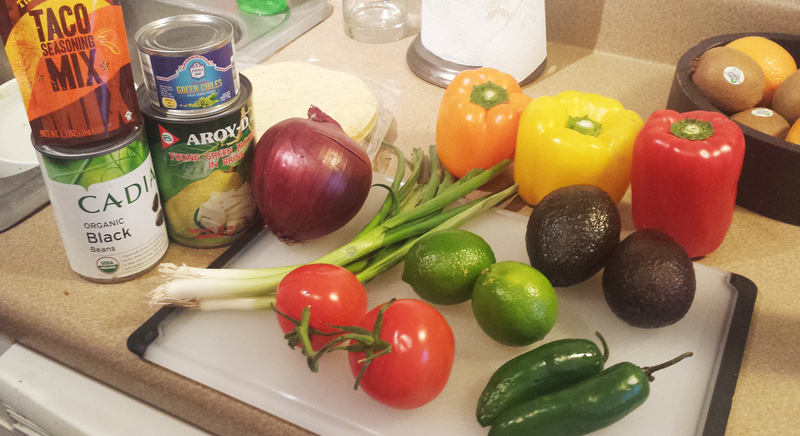 In between stirring fajita veggies, start prepping your salsa and guacamole. Both are pretty simple. 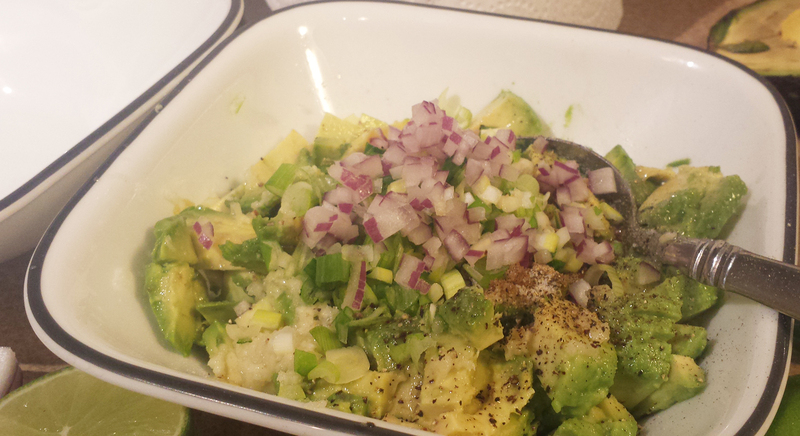 For the guacamole simply scoop out the avocado, give it a good smash and stir in finely red onion, crushed garlic, lime juice, cumin, scallions and jalapeno. Start with a half teaspoon of salt and pepper, taste and adjust to your preferences. The pico is equally as easy. Dice up your tomatoes into small cubes. 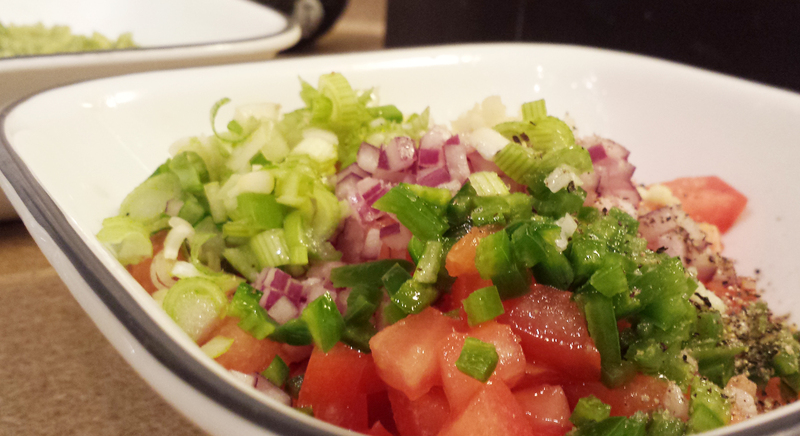 Mix in finely chopped red onion, crushed garlic, chopped jalapeno, and lime juice. Stir it up and you're set! To assemble, wrap your tortillas in a cheese cloth or lightweight kitchen towel and microwave 90 seconds. Place a bed of lettuce or kale on the bottom of each tortilla and pile on a ample serving of jackfruit and fajita veggies. Finish the tacos off with pico and a dollop of guac. I drizzle mine with hot sauce and squeeze on a bit more fresh lime. Enjoy!